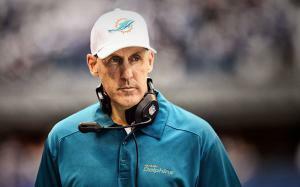 Joseph “Joe” Philbin is an American Football coach born on 2nd July 1961 in Springfield, Massachusetts, USA, and is best known as the former head coach of the Miami Dolphins, and former Offensive Co-ordinator of the Green Bay Packers. Currently, he holds the position of offensive and assistant head coach for the Indianapolis Colts of the National Football League (NFL). Have you ever wondered how rich Joe Philbin is? According to sources, it has been estimated that Philbin’s overall net worth is $11 million, acquired largely during a long and rewarding career in sports, which started in the early ‘80s. Since he is still actively working as a coach, his net worth continues to grow. Joe was born to Mary and Paul Philbin, and went to Longmeadow High School. He did a post-grad year at Worcester Academy, and later enrolled at Washington & Jefferson College, during which he was a member of Lambda Chi Alpha fraternity. Philbin graduated in 1984 with a BA in sociology, and played on the football team for a year too. He then continued his education in Masters studies in administration and supervision at Tulane University. After finishing his studies, Joe coached at the collegiate level for the next 18 years. He was offensive line coach at Ohio University and offensive line coach and offensive coordinator at Northeastern University. He spent four seasons at Allegheny College, and helped them win the national championship in 1990, then being offered the head football coach position at Washington & Jefferson college, but decided to turn down the offer so that he could coach at Iowa, where he served under Kirk Ferentz. His net worth was certainly rising. Philbin joined the coaching staff of the Green Bay Packers in 2003, and spent the next nine years there. During this period, he worked as offensive coordinator and led the team to the top 10 in the NFL and brought the team a victory at Super Bowl in 2010. Joe was named the tenth head coach of the Miami Dolphins in January 2012. However, Philbin didn’t manage to lead the team to winning records or make the playoffs in the first three seasons of his tenure – the team’s offense improved but the defense deteriorated. This resulted in Joe being fired due to poor game management. He was later hired by the Indianapolis Colts for the 2016 season, and now holds the position of the team’s assistant head and offensive line coach. When it comes to his personal life, Joe has been married to Diane Marie since 1988, and the couple had six children. An unfortunate event happened in Philbin’s life in January 2012, when his son Michael was reported missing, and soon found dead. The toxicology results showed Joe’s son was under the influence of alcohol when he died. Joe and Diane reside in Green Bay. 1 Head coach of the Miami Dolphins, 2012-present.